ASUP purchased the school a new Victory Bell to use during games! I'm surprised no one has said anything about it yet, especially the alumni on this page. I would certainly like to hear a few bell stories! Let it ring! RipCityPilot wrote: ASUP purchased the school a new Victory Bell to use during games! I'm surprised no one has said anything about it yet, especially the alumni on this page. I would certainly like to hear a few bell stories! Let it ring! The official UP story on the website states the clapper was restored to the bell in 1945 after the "final victory" of WWII....well that may have been the case, but we did not have a clapper for the victory bell in the '60's. We attempted to find one without a bell to use, but it turns out a clapper by itself was rare and very expensive. So, the bottom line is this: if you were to look inside the current bell (not the new one about to be dedicated), you will find that it is heavily marred on the inside.....why is it marred so badly you might ask? 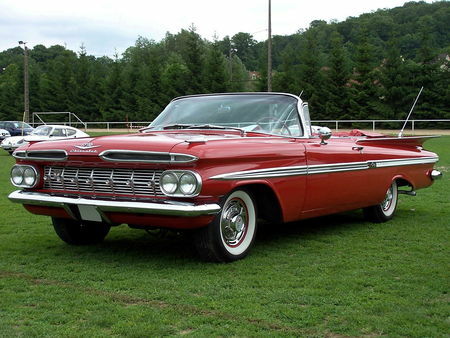 Well, for four years, after every victory, I would ring that bell with the tire iron from my '59 Chevy Impala convertible. True story, and part of UP's history. You'll see my Impala on many of the pages of the various "Log" yearbooks of the time, either parked near the athletic fields or carrying pom pom girls in a homecoming parade in downtown Portland. Years after I sold the car in Texas, one of my UP roommates, a basketball player, found it and restored it..........and recently sold it for $92,000. (It was my first car; I bought it used for $900 in 1963). Hey! You asked for a story! Biggest cowbell I have ever seen. DD, always good to get the latest installment of Tales from UP History, especially lesser-known details like the tire-iron era. Geez, the onus of bell-lifting, should such an need arise, falls to Villa and/or Padre. The plan suggested at ASUP Senate Meetings last year was to have students pull the cart around campus, hence the handle on the front. ...which Wally Pilot will ring after each goal scored by the Pilots throughout the season. How will the bell-ringing co-exist with the flag running and how soon before the ringing gets allocated to the Pilot for a Day or 'campus celebrity guest' like the new AD for a Sunday Afternoon match? The bell will also ring out to celebrate victories by every UP athletics team. Will this apply only to home victories or might it ring for road wins? How will the ringing apply to track: will ringing celebrate only team victories or individual accomplishments?